Yeah, I’m still around, though I haven’t much to say on the Doctor Who front, since CBC still hasn’t announced an air date for the start of Series Four..
Last edited by Feena on Mon Jul 16, 2012 6:32 am, edited 1 time in total. Yeah, I heard about that an hour ago. Yay! Also Yay!, we're going to be getting "The Invasion of Time" and "K-9 Tales" on September 2nd, the same day we also get the Live Action Transformers Movie in Blu-Ray! And if we're getting "Invasion of Time", the Bred for War set can't be far behind. Can't think of any reason why that'll get dropped like the Davros set. Last edited by SithLordWiccan on Mon Jul 16, 2012 6:32 am, edited 1 time in total. Then why has he frakked up their legacy even worse than during the lowest of the JNT era? See I don't see that at all. What does bug me though is they were destroyed in the time war and yet they keep finding more and more of them. Last edited by WebWarlock on Mon Jul 16, 2012 6:32 am, edited 1 time in total. What does bug me though is they were destroyed in the time war and yet they keep finding more and more of them. That's what I was talking about, yeah. Ok, yeah I get that. The deal is with me I never was a big Dalek fan. I liked the Cybermen much more. Course I can appreciate how scary and important the Daleks were/are they just kinda get on my nerves after a while. I am hoping that under Moffat we see less of them in favor of some other aliens, old or new. The problem is that the new series was built on the fact that the Daleks, like the Time Lords, were wiped out. Doing anything to go against that shows a lack of ideas, no matter how much RTD believes the Daleks need to be in the show. Now, to be fair, "Dalek" was a classic, and not that bad of an episode. It's just that, as the Law of Diminishing Returns proves, subsequent uses never quite reached that level. Of course, that may have something to do with the fact that a "Get Out Of Jail Free" card was employed each and every time, simply to cart them off for their next appearance. It's just that, as the Law of Diminishing Returns proves, subsequent uses never quite reached that level. Of course, that may have something to do with the fact that a "Get Out Of Jail Free" card was employed each and every time, simply to cart them off for their next appearance. Not a fan of "Emergency Temporal Shift" then! That was something else really. No of course I want to know more about the Doctor and the archeologist. I have to admit at first I thought she end up being Bernice Summerfiled. 'Something else' in a good way? I've never read any of the books so I never thought of her. Tottally in a good way! I have seen the new trailer, and I just have to say one thing: at what point does the BBC quit playing the whole The Fans Know Davros is the Series Four Big Bad, But We’re Not Going To Say So” game? Answer: 47 seconds into said trailer. Tomorrow's episode Midnight is supposed to be excellent, very scary and one of RTD's best! Wow. Ironic. The Season Finale of Battlestar Galactica sent me on such an emotional high, even this piece of frak can't bring me down. I'll give them credit, thought. It looks like Davros. But then again, so did the Cybermen, and we all know how quickly they went from being a credible enemy to a throwaway plot. Wow. Midnight. Steven Moffat might have a rival for this year's Hugo Award - and that's not something I ever thought I'd say about an RTD episode! It was like an episode of The Twilight Zone, and I loved it. Thanks for the Davros pic Feena. There had been rumours some time ago of a younger actor playing Davros so I was expecting a younger Davros with lot less make-up. I'm glad to see I was wrong though. It wasn't my cup of tea I'm afraid. It got too dark for me at the end. I would have preferred it as a Torchwood episode rather than Doctor Who. Last edited by erith on Mon Jul 16, 2012 6:32 am, edited 1 time in total. Profile of RTD in this weekend's New York Times. RUSSELL T DAVIES, perhaps the most admired writer and producer working in British television drama, was once confronted at a wedding by a fellow guest bristling with indignation about a scene in Mr. Davies’s hugely successful, family-friendly science fiction series, “Doctor Who.” In the scene Capt. Jack Harkness, a swaggering intergalactic hero who exuberantly lusts after both men and women, plants quick kisses on the mouths of both the title character and the title character’s female sidekick as they face imminent death. House: "Another life saved by girl-on-girl action." According to the Doctor Who Files book on the Cult Of Skaro, Dalek Sec was the Commander of the Seventh Incursion Squad and led the attack on the Mechanoids on Magella before being promoted by the Dalek Emperor. In other words, it would appear that Sec was the Dalek Supreme seen in "The Chase." How's that for a retcon? A little retcon never hurt anyone. THe finale looks HUGE. Capt. Jack, Gwen, Ianto, Sarah Jane, Martha, Rose. Everyone in RTD's family album really. I have been trying to get my wife to watch Genesis of the Daleks before this all happens. I might have to withhold new Whos from her till we do. You're telling this to a guy who, as a Star Wars fan, has seen some pretty big whoppers over the years. If that's what I think it is (the clip from BBC), then I have to do the most amazing thing I've ever done. It starts August 8th. Which is amusing, as we'll be getting Series 2 on DVD September 16th. So unless they air it on weekdays or do two episodes a week, it won't be done by the time of the DVD release. It's actually a clip from a Channel Four programme so it may be a different one. Michael Brandon is in it as a UNIT officer in New York, declaring that "we are at war". Cue lots of daleks! Yeah, I'm surprised, too. But between the BBC clip and the two trailers, I'm starting to think think this might not be the overblown, gimmicky fan-fic riddled plotline RTD's finales have become known for. Course, I could end up being wrong. We'll known for sure this time tomorrow...at least partially. Next week's the real test. Someone point me in the direction of a YouTube link. Me wanna see. The link above should work for you, I think. If not, this is Youtube but the quality's not so good. Well, I don't know that website, and I'd prefer not to risk my computer on an unknown website. That aside, awesome clip. 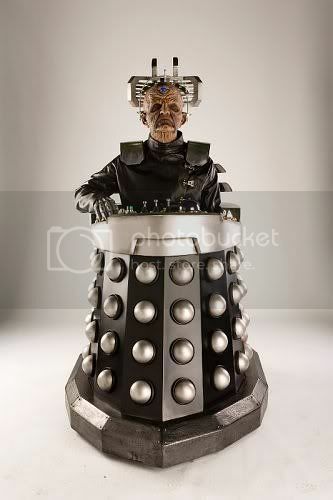 And isn't it funny how the new Dalek Supreme sounds just like the Emperor from "Parting of the Ways?" Last edited by SithLordWiccan on Sun Jul 15, 2012 3:20 pm, edited 1 time in total. The Daleks have stolen planets from across the universe and are starting to destroy Earth - it has to be big! OK, I'm halfway through the episode (somebody's posted it on YouTube, though I don't expect it to stay long), and all I'll say is that I officially take back every negative thing I've ever said about it.